Pakistan rejected on Wednesday U.S. criticism of its efforts to fight terrorism saying it should not be used as a scapegoat for the failure of the U.S. military to win the war in Afghanistan. U.S. President Donald Trump unveiled his policy for Afghanistan on Monday, committing to an open-ended conflict there and singling out Pakistan for harboring Afghan Taliban insurgents and other militants. U.S. officials later warned that aid to Pakistan might be cut and Washington might downgrade nuclear-armed Pakistan's status as a major non-NATO ally to pressure it to do more to help bring about an end to America's longest-running war. 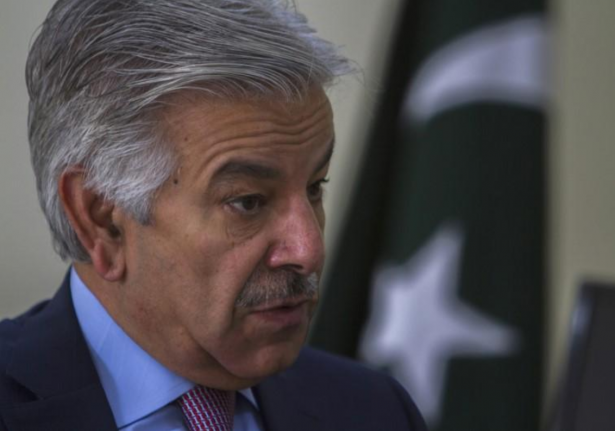 Pakistani Foreign Minister Khawaja Asif added his voice to a chorus of indignation in Pakistan over the U.S. criticism, reiterating Pakistan's denial that it harbors militants. "They should not make Pakistan a scapegoat for their failures in Afghanistan," Asif said in an interview to Geo TV late on Tuesday. "Our commitment to war against terrorism is unmatched and unshaken." But critics say the Pakistani military nurtures other Islamist factions, including the Afghan Taliban, which are seen as useful to Pakistan's core confrontation with old rival India. Asif said Pakistan had suffered great losses from militancy - the government estimates 70,000 people have been killed since Pakistan joined the U.S. "war on terrorism" after the Sept. 11, 2001, attacks on the United States. But he said Pakistan's efforts to fight terrorism were being taken for granted and dismissed the notion the United States could "win war against terror by threatening us or cornering us". "Our contributions, sacrifices and our role as a coalition country have been disregarded and disrespected," Asif said. U.S. Secretary of State Rex Tillerson, who is due to meet Asif in coming days, on Tuesday outlined a range of options to change Pakistan's approach but conceded there were concerns about putting too much pressure on Pakistan. Asif said Pakistan was also angered by Trump's appeal to India to do more in Afghanistan. "Attempting to isolate Pakistan will not yield anything but a dangerous sharpening of strategic fault lines," said Sherry Rehman, a senior opposition politician and former Pakistani ambassador to the United States. Former cricket star turned opposition politician Imran Khan said Pakistan should finally learn a valuable lesson: "Never to fight others wars for the lure of dollars," he said on Twitter.